1 of 5 If needed, quickly pound pork chops to 1/4-inch thickness. Place bread crumbs and 1/2 tsp of the salt in a shallow bowl. Whisk egg plus 2 tbsp water in a second bowl. Place flour in a third bowl. 2 of 5 Coat 1 pork chop in flour. Dip into egg mixture, allowing excess to drip back into bowl. Coat with bread crumbs and transfer to a large cutting board. Repeat with remaining pork chops. 3 of 5 Place salad greens in a large bowl. Peel oranges and slice into half-moons. Add to greens. Juice 1 lemon to yield 1/4 cup juice; cut second lemon into wedges. Whisk lemon juice with honey, mustard, remaining 1/4 tsp salt and the pepper. Whisk in olive oil and toss with salad greens. 4 of 5 Heat 1 1/2 tbsp of the vegetable oil in a large skillet over medium-high heat. Add 4 pork chops; cook 3 minutes, turning once. Repeat with remaining 1 1/2 tbsp vegetable oil and 4 pork chops. 5 of 5 Divide salad among 4 plates. 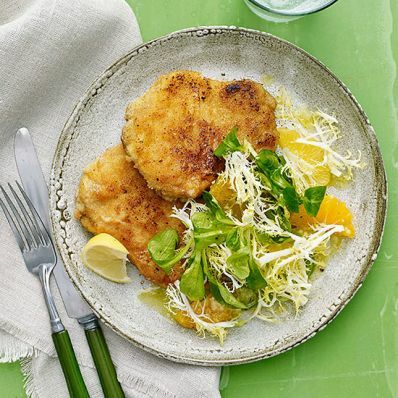 Top each with 2 pieces pork schnitzel. Serve with lemon wedges on the side.